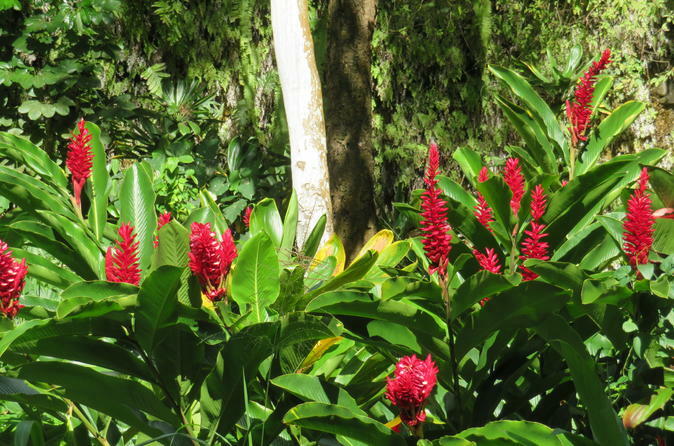 Descubra algumas das paisagens e atrações culturais mais encantadoras de Garden Isle em um passeio turístico de um dia inteiro por Kauai. 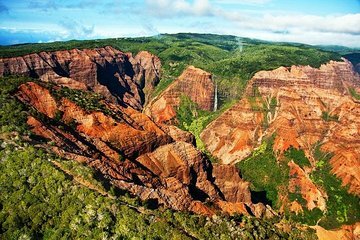 Observe a majestosa e multicolorida extensão de Waimea Canyon, seja cercado pelo exuberante paraíso tropical da Fern Grotto e aprenda sobre as sagradas lendas havaianas em um cruzeiro pelo rio Wailua. Veja muitos dos destaques da costa sul da ilha ao longo do caminho, incluindo a antiga cidade de Koloa, o esguicho natural de Spouting Horn, o Captain Cook's Landing e o Coco Palms Grove. Nani was a terrific tour guide. She is a very spunky lady and made the trip all the more memorable for it. The Waimea Canyon portion of the trip was beautiful and even though there were clouds and we were not able to see into the canyon, it was well worth the tour. The Fern Grotto portion was not as spectacular but was nice. Excellent Tour, very informative and entertaining. My spouse and I recently took the all-day van tour during our visit to Kauai. It was very convenient to be picked up at our resort. This is a great way to see a lot of things if you new and/or unfamiliar with the island. Later in the week, we were able to return to some of our favorite areas to explore further without any trouble. Our guide, Michelle, was friendly and informative. We enjoyed the Spouting Horn, the Waimea Canyon, and a variety of other sights. The lunch stop was at a brand new Chicken in a Barrel restaurant set in a lovely location with ocean views. We would definitely recommend this tour to anyone as you see and learn more than trying it on your own. We also enjoyed the boat ride and the walk to the fern grotto at the end of the day. Our tour guide and driver was Nani, one of the most sympatic, energetic and friendly person we've ever met. This tour is really good, we recommend it if you are interrested in an island life and want to discover it little more deeply. You will see a lot, you will visit a lot, you can buy a lot... definitely recommend it if you do not want to lay on a beach only and want to touch this country and meet people. Our guide was Nani and unfortunately retiring next week. She was simply amazing. A life-long resident of the area, she knew everything and everyone. She looked a bit frail, but took us places other tours would not have considered or perhaps even allowed? She is a lovely, lovely person and full of energy. But regardless of the guide, you do need to see the Canyon. The Grotto has never fully recovered from when I last saw it 20 years ago, but still worth the trip .I'd give Nani six stars, the boat trip only a four. Larry, the tour guide was excellent. Very knowledgeable and spent only the time that our tour of only 4 people wanted at each site. We were very lucky to have so few people on our mini bus as we were able to do many extra sites. Didn't have to wait for 49 people to get on and off the bus! The canyon was beautiful! Hard to believe there is something like that on Kauai! The boat trip and Fern Grotto was a perfect ending to a fabulous day! So glad we booked this trip and so glad we had Larry as our guide. This was a spectacular tour full of the highlights of the southern part of the island and great tips on where to go on the northern end of the island. Waimea Canyon and Fern Grotto were great.? ?Michelle was a super guide, if you are lucky enough to get her, the trip will be phenomenal!